Ugly Angel: Who is killing Las Lomas . . . and why? Renderings of Las Lomas copyright Richardson Partners. The proposed Las Lomas development, on a steep hillside just northeast of the junction of the 5 and 14 Freeways in northern Los Angeles County, has been—and is still—under attack by a variety of forces, from the Los Angeles City Council (in the person, mainly, of Council member Greig Smith) to the neighboring boomburg of Santa Clarita, itself a relative newcomer, having been incorporated only in 1987. I first discovered Las Lomas through the captivating drawings of architect Richard Robertson, a Los Angeles–based historicist who was attached to design the town. 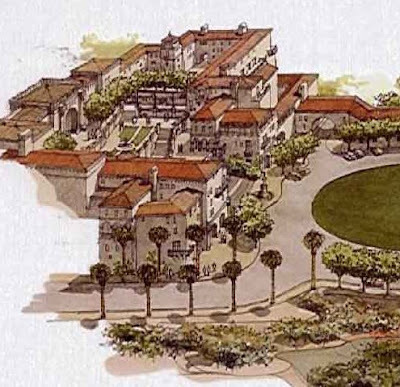 In a model of New Urbanism at its best, Robertson developed a plan for a town of 5500 housing units with a feel that harkens back to pre-WWII Los Angeles, featuring Spanish-revival architectural cues and responsible, high-density (6461 units per square mile versus 1096.5 in Santa Clarita) land usage that rivals that of Italian hill towns, which means that more than half the 550-acre site would be devoted to open space. While Las Lomas is a rationally designed urban plan (see more here) featuring six differing neighborhoods united by a common design language, Santa Clarita is a mishmash of architectural styles, from the shopaholic paradise of Westfield Valencia Town Center to catatonic McMansion sprawl to the upchuck-inducing thrill rides of Magic Mountain. Suburbia as planned urban texture. Although increased traffic congestion on Interstate 5 looms large in Santa Clarita's public objections to the project, one suspects that the town's real motives (and those of their self-styled "Mayor Dude") are rooted in fear of encroaching urbanity and—could it be?—downright jealousy. As for the Los Angeles City Council's double-talk stymying, the Lomas Land Co.—now under Alan Joelson, since Dan Palmer resigned in December 2008 citing "personal reasons" (aka downright digust? )—has appealed the dismissal of its lawsuit against the City of Los Angeles for halting review of the project in March of 2008. Read all about that here. We will continue to follow the project with keen interest, in the hope that an urban plan of this vision, elegance, and importance will not be killed by self-serving anti-urbanism.